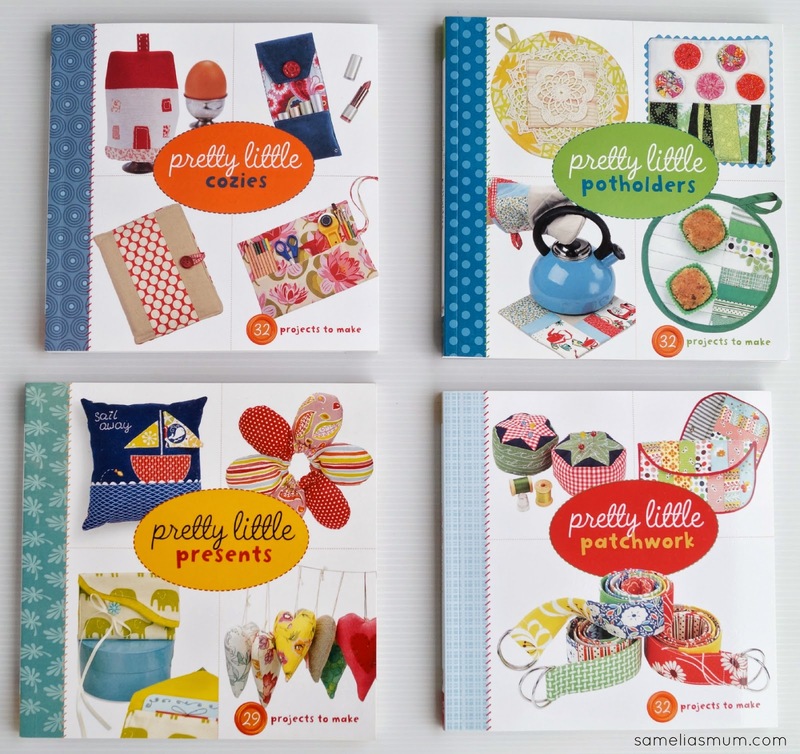 The “Pretty Little” series of books from Lark Crafts are just delightful and I’ve been lucky enough to have a little look through Pretty Little Presents, Pretty Little Cozies, Pretty Little Patchwork and Pretty Little Potholders. I personally think that young/new crafters will absolutely love the projects within these books. They are fun, with bright photos and fun fabrics. They’re contemporary, practical and a good first step into the the sewing, crafting, quilting world. Each book has an introductory chapter with detailed instructions and diagrams of the skills required within the projects. It covers everything from fabric types and selection to the tools (ie. Sewing Machine, types of needles etc) . The only draw back I find with these books is that templates need enlarging. I'm probably just being lazy, but I am a fan of templates which don’t need any extra work. Honestly though, as most of us have printer/photocopiers at home, this really isn’t a major problem. Next time you’re book shopping for yourself or for a dear one, pick up one of the “Pretty Little” books. They’re quite affordable and make a wonderful addition to any craft book library. The most difficult decision will be which book to buy… and then which project to work on first! The Pretty Little book series is available from Booktopia and Can Do Books. Would you like to win one of the Pretty Little books? Just have a look at the top picture and tell me which book (from those four) you would like to win. If you’re on Facebook, pop on over to my Samelia’s Mum page (and find the post with this same image) for a second chance to win. I’ll choose a winner on Sunday night (AEDST) and post it out next week. So hard to choose, they all look so pretty! Ummm ... Pretty Little Presents I think. Pretty Little Patchwork caught my eye!! Thank you!! Oh it would be hard to choose--I like Patchwork but I also like Presents. Oh no! Decisions! Pretty Little Presents would be great for new ideas for swap gift extras. They are very cute. Love a little patchwork book - don't have any but always on my wish list. They all look like lovely books. I really like the look of Pretty Little Patchwork. Thanks for the lovely giveaway, Anorina. They all look good but I think I would pick the Pretty Little Presents! I would chose Pretty Little Patchwork. Thank you for the chance to win, have a great day! I would love Pretty Little Patchwork. Thanks! I would like to win the Pretty Little Presents book. I love to make gifts for people! Thats what motivated me to start sewing! Gosh, it's so hard to choose! I'd go for the Pretty Little Potholders since I love to gift them to friends and are usually so easy to make. Who doesn't use pot holders anyway? Pretty little patchwork please. They all look gorgeous though! Oh they are cute. Pretty little patchwork would be my pick. Very hard choice! They all look amazing! My choice would be Pretty Little Patchwork! Thank you for the fabulous giveaway! They're all wonderful little books so it's hard to choose. My pick is Pretty Little Pouches. Thank you Anorina - I'm crossing my fingers! Patchwork looks adorable or Potholders. They are all too cute! PRETTY LITTLE PRESENTS would be fabulous thank you. All 4 books would be wonderful to own. My choice is Pretty Little Presents. Thanks for the chance these books look cute. No contest Pretty Little Patchwork would be my favourite, Looks interesting and fun !! Pretty little Patchwork looks very inviting!! They all look so nice. I would like all of these books, if I had to choose it would be potholders. Mine never come out right, so I believe that this book would help me get better results. Eeeny, meeny, miny moe..........pretty little patchwork! Pretty little presents. I like variety in a craft book and it looks like it would deliver. Tough decision, but Pretty Little Patchwork looks great! I would like Pretty Little Patchwork. Looks like fun. Thank you for this great giveaway. Pretty Little Presents. I confess that I will probably buy all of them! All of the books are gorgeous, I will be happy with them. Do you plan to sell these maybe in downloadable e-book format? I love them all! But I would like to win Pretty Little Presents! Thank you for the give~away! It's hard to decide since they all look good!!!! I think Pretty Little Presents looks great. Presents so I can share with others!! I love to sew but keep very little for myself!! The joy is in giving to others!! I'd choose Pretty little Patchwork! OOh tough decision! I thinkPretty Little Presents is my favorite. They all look so sweet... This is a tough decision!! I would select Pretty Little Cozies. I would love pretty little presents! Hard decision, but I decided on Pretty Little Patchwork! I went to Samelia’s Mum page and liked the post. I like the assortment of designers since you have many different styles of projects. It's easy to find something that appeals to you. I think the Pretty Little Cozies book looks like fun. The egg cozy is adorable! I love the thought of all the pretty little cozies! thanks! If you chose me I would like the Pretty Little Patchwork book, but if that one has already been chosen, I would also like the Pretty Little Potholder book! Pretty Little Patchwork! I'm not a huge fan of having to enlarge pattern either, but these do look very well set out. mmm....probably between the three 'P's'...but I think Potholders by a nose. They make such lovely gifts! Awesome giveaway!! pretty little presents or Pretty Little Cozies looks great! would love to use either for gifts for friends! I would love a copy of Pretty Little Presents I think. Although the patchwork one looks great too. Thanks for the chance to enter.